Installed this in my garage. The quality of the product seems ok. The ends continually want to curl up, even after laying flat for more than 2 weeks. I place heavy objects on the ends, trying to flatten them, but they still want to curl. I was told to use carpet tape to keep the ends down, which helped some. I think the cost reflects the price of shipping, which is FREE. Seeing this is a large and very heavy item it must cost quite a bit to ship and that must be reflected in the sale price. Time will tell just how well this stands up. It looks fairly nice and seems durable. It's the ends that really bother me. Hopefully, your experience will be better than mine. 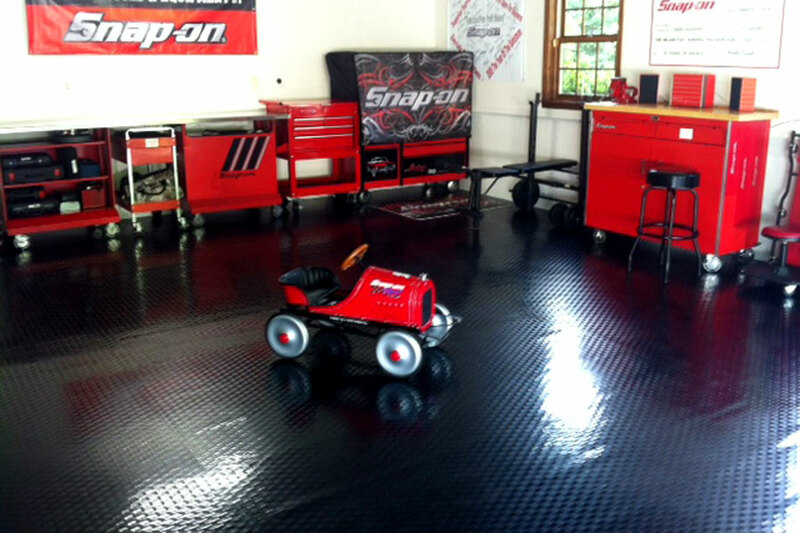 First off I love the flooring I really think it well give my garage that wow! effect that will help to sell it, but even if your not selling it sure feels good, and today its hard to feel good about anything. The main reason I am replying is to help. The Rolls come 7.5 ft. by 17 ft., so they obviously have to be cut. My garage is 18 ft. wide ad 20 ft. long. If you only cut your 3rd roll to sections of 10 ft. and 7 ft. for length then you can cut the 10 ft. pieces in half and turn one of them 180 degrees then you halve factory cut seems meeting through out this 18 ft. width. You now halve 3 pieces 7ft. by 7.5 ft., so cut them to 3ft. pieces measuring from the factory end and place all factory cut ends together and you should perfect factory seems meeting every where except the outside perimeters. *Note: To Rubber Flooring; I think this message should be distributed with all garage shipments. and to customers: Don't be intimidated by this project. It is a bit of or work but definitely worth the effort. *Note two to customers; Be careful to try and keep your pieces square and don't trust your wall; as the are often not square. John Pelerin Good luck to all. I am in the process of installing the product right now. It is easy to work with. I am putting it down on a sometimes uneven cement floor and stairs. It molds to the contours nicely. No instructions came with the product so I didn't know what type of glue to use. It is a polyvinyl product so I decided to use vinyl baseboard adhesive and it has worked really well. My Flooring was received on-time. When I unrolled flooring to inspect I found what appeared to be air entrapment(bubbles) in the coins specific, along the edge of one side of the carpet/mat. It appeared to be a processing problem in the Manufacturing process that made it through the Manufactures Quality Control Dept. undetected and ultimately to the customer (Myself). 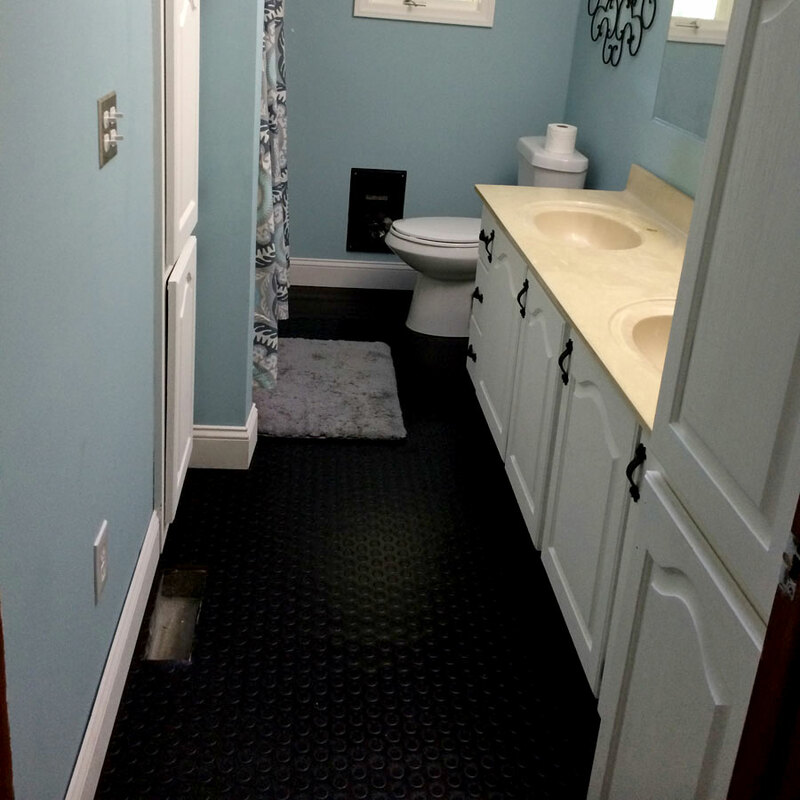 Since I did not want to go to the time and expense to return the flooring I opted to use as-is. I would recommend that who ever Manufacturers this flooring needs to do a better job inspecting to catch these type of defects in the future. this stuff worked great, I went to Home Depot and got some pressure sensitive glue, spread it with a 1/16 x 1/16 trowel and it worked great. Product was received fast and in good shape, would buy again. Flooring looks great, price was great and shipping was great. 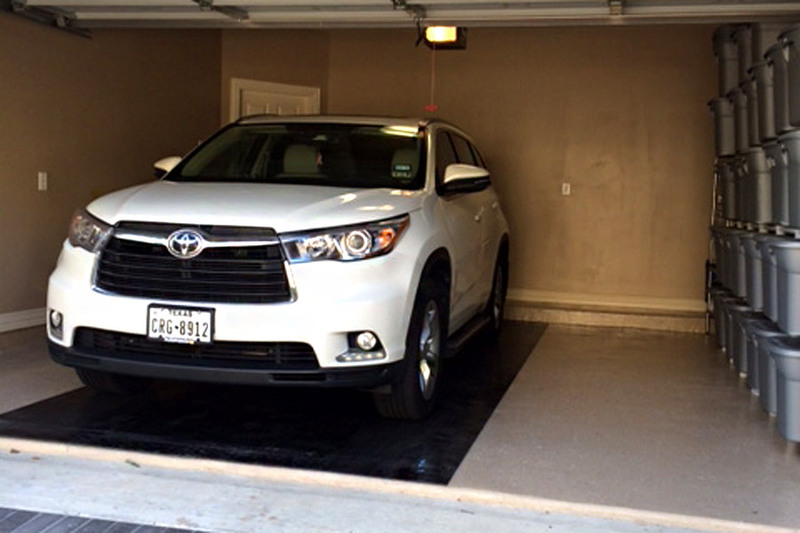 I had just finished doing the garage and I needed something to protect the floor from the car and golf cart. This was the solution. It was easy to installed and my garage looks very professional. The cleaning of the mat is easy. I'm very Happy. Product is great! However, very different packaging method on this last order compared to the first. Orders seem to have come from different facilities. 1st order : flooring was on cardboard tubes which made rolling out much easier and no creases. 2nd order: flooring was rolled but without cardboard tubes which made rolling out very difficult & resulted in multiple creases which I am still working on getting out. Love the product just needs to be consistent on delivery packaging. Worked perfectly. I installed it onto the aluminum floor of my car hauler. The product arrived on time and was easy to install. It's kept the melting snow from my car, off my garage floor and makes clean up very easy and quick. I wish I could highly recommend this product but I can not. I did install it myself. When first installed it looked great (until we drove on it) - except for wrinkles left from being rolled up on shipping tube. The most glaring problem is that is shows black tire marks and when we tried to remove them we could not. Ordering the pre cut 7.5x17 creates a problem. It is rolled so tight that when laid out it leaves what I call wrinkles that do not dis-appear. 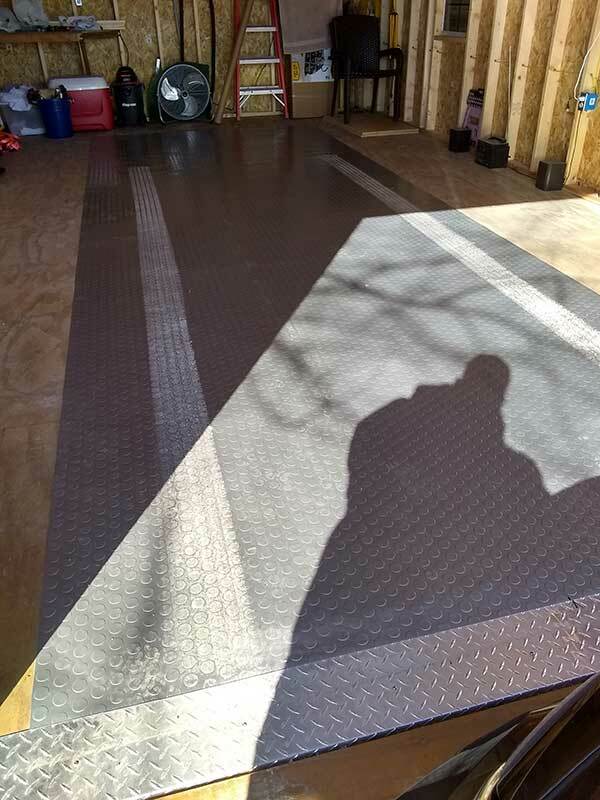 If the garage has expansion joints they need to be filled and completely level with existing floor otherwise they will show bumps or if not filled dips. Butting joints is not easy. I did not want to use double faced tape and instead glued seams. I did so because I did not think tape would hold. In retrospect the tape might be better- it would have have been easier (I think). Perhaps in the long run it would have been better to find a professional installer and to order custom fit (length and width (say 11 x 22)pieces. That would eliminate 1 seam. However it would have increased the cost to the point where I could have had an epoxy type surface installed for a little more money and far fewer problems. On a more positive note I found the representatives very good to work with. they were responsive and most helpful. For many years I have been using many different kinds of materials as finish material for refurbished Wheelchair vans. This is the best material. It is tough, easy to clean, attractive ( in an industrial way) and it is easy to cut and lays down smooth and easy. For any sort of working vans or workspace floors, this is what I recommend. 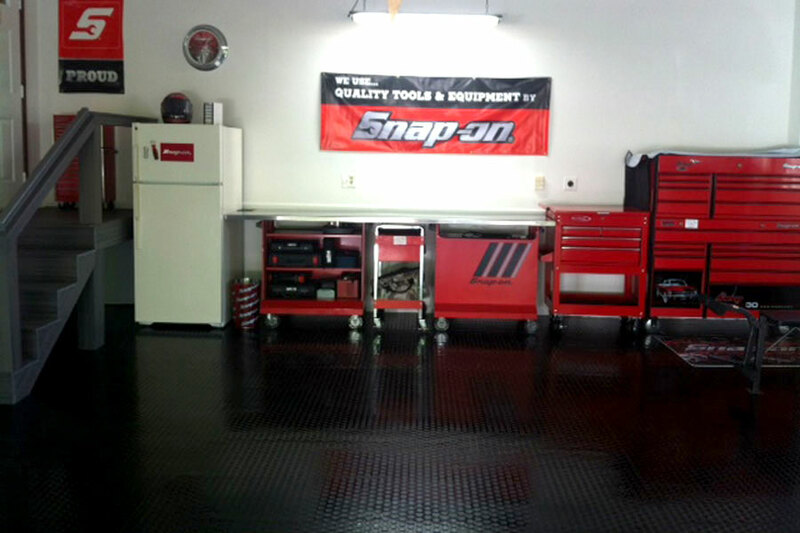 This product did exactly what I wanted - gave my garage floor a clean and classy look. My only issue is that both ends continue to curl after two weeks of being weighted down with weights spaced 1 foot apart. I wasn't prepared to glue it down but may have to, to make it safer on the ends. Otherwise, I really like the look and cleanliness it provides. Even my car looks better sitting on it. My friends and neighbors are envious. very heavy duty. wish wouldnt use fedex but it is what it is. fast delivery. wish custom cut length wasnt so expensive. i needed more of a runner- around 4 feet wide but 18 foot long. i bought 7.5x17 roll. I will have to have a seam so hoping not to rip it.